Curtis Granderson had his best season since 2011, leading the Mets in Wins Above Replacement. The Mets were a team that really flew under my radar this season. When they faced the Reds in Late June, they had just fallen behind the Nationals for the division lead. For their part, the Nationals seemed to be heating up, and were the heavy favorites to win the division in the preseason. Therefore, this seemed like a classic case of an over-performing Mets team that was in the process of regressing back toward .500 where they seemed to belong. I didn't expect that by late September, when the Reds faced them again, they would be at the top of their division and sailing into the playoffs. And yet, as I write this, the Mets have finished off a talented (if under-performing) Los Angeles Dodgers team in the division team, and are currently up two games to none of the young and exciting Chicago Cubs, having toppled both Jon Lester and Jake Arietta. They are the favorites to represent the National League in the World Series. It's high time to take a look at this team: are they just on a good run, or is this a legitimate, championship-caliber ballclub? 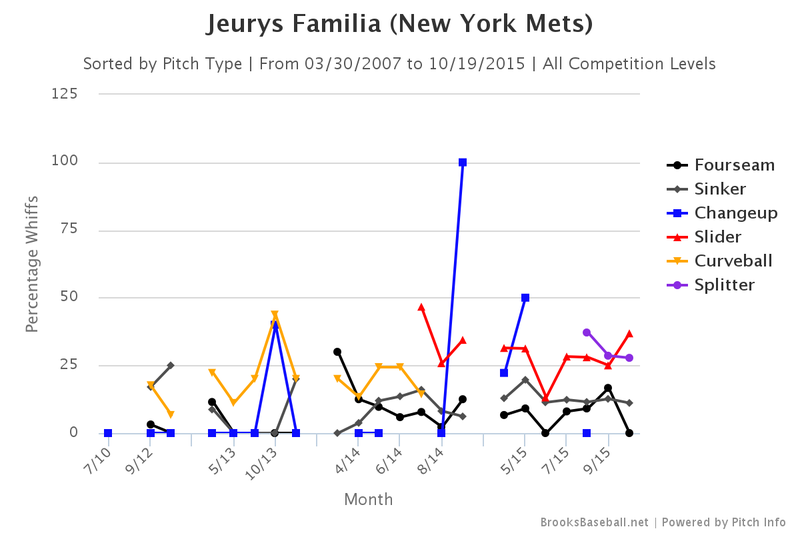 The most impressive offering featured by the Mets is unquestionably their outstanding young starting pitching. While I am crushed by the lack of a Bartolo Colon start, the trio of Jacob deGrom, Matt Harvey, and Noah Syndergaard is about as good as it gets among playoff teams. They matched up to Clayton Kershaw and Zack Greinke very well, and seem set to carve up teams in what remains of the playoffs just as they've done all season. The Mets are otherwise solid everywhere else: they hit pretty well, field pretty well, and have a solid bullpen backed by an excellent closer. In short, they're a team that's really good at one important thing (starting), and a team that has managed to avoid having holes anywhere else. That's a good recipe for success. Despite the completely avoidable and frustrating loss of Ruben Tejada, and the loss of Juan Uribe just before the playoffs began, the Mets look really solid top-to-bottom here. David Wright came back just in time to mitigate the loss of Uribe, and Wilmer Flores, who began the season as the Mets' starting shortstop, hit just as well this year as Tejada while posting solid fielding numbers. And the team still has depth: with the acquisition of Yoenis Cespedes, Michael Cuddyer has shifted into a platoon with Lucas Duda, whereas Juan Lagares offers a fielding-based platoon option with Michael Conforto in left field. Otherwise, the Mets have gotten solid to above-average seasons from everyone involved. 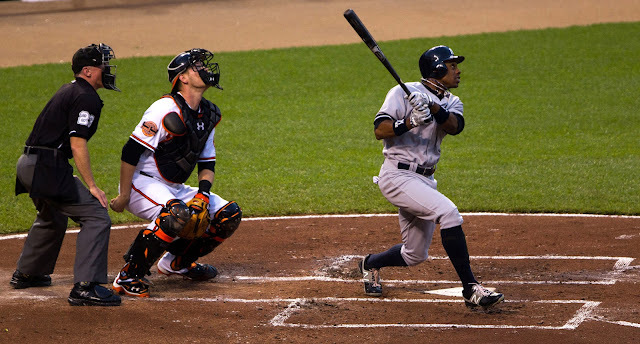 It's really fun to see Curtis Granderson, a favorite of mine since his time with the Tigers, having a great season once again as a 34-year old. 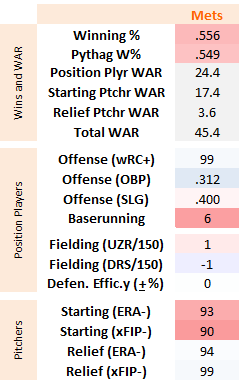 And man, Yoenis Cespedes has been amazing. The vast majority of his fielding totals come in left field rather than center field, but I've seen little to indicate that he can't be passable in center. He has been a force with the stick since arriving in New York, but (thanks to fielding numbers) posted 4 of his 6.7 wins with the Tigers. He's having a fantastic contract year, easily his best ever, slugging 35 home runs and seeing only very mild BABIP inflation that offsets the decline in his already-low walk rate. I don't think I'd pay for more than 3.5ish wins for him as a free agent, and he's already 30 years old, but he's a tremendous source of right-handed power and quality fielding. One shouldn't overlooked Michael Conforto, either. The left-handed side of the Mets' outfield platoon posted 2.1 WAR after rising to the majors in his first full professional season. There's but a lot of hype about Kyle Schwarber of the Cubs, and justly so. But Conforto, just 22, has done nothing but hit since signing in last year's draft, and is a guy who could still contribute in a big way to the Mets' success this postseason. One other mid-season addition, in the form of a return from injury, was Travis d'Arnaud. d'Arnaud has long been a feature near the top of the catcher framing lists, and this year was no exception. He also had an excellent season with the bat, finally getting his BABIP over the .280 mark for the first time in his MLB career, while slugging a very impressive 12 home runs in 268 PA's. How incredible is the R.A. Dickey trade looking for the Mets, now that both Syndergaard and d'Arnaud have blossomed at the MLB level? 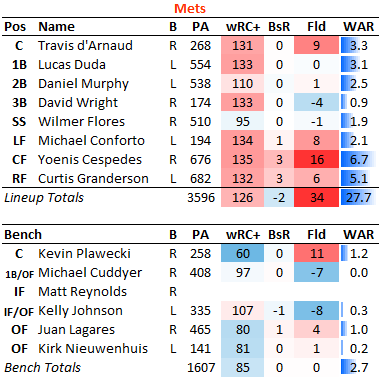 With the additions of Cespedes and Conforto, and the return of d'Arnaud, this offense is probably better now than they have been all year long. Wow, right? Between Jacob deGrom, Matt Harvey, and Noah Syndergaard, the Mets have three ptichers who all throw super-hard, post superb strikeout numbers, and do not walk anyone. Their repertoires look pretty similar too, at least one the surface: hard fastballs, quality breaking stuff, and effective change-ups. Oh, and the #4 starter, Steven Matz, is another 24-year old who throws 94 as a left-hander, while posting peripherals that were almost as good as the elite. It amazes me that, on a per-inning basis, Matt Harvey arguably had the third-best season among this group. And he's still throwing, despite his oh-so-controversial innings cap. If you ask just about any general manager to describe the qualities of a dream rotation that you can build a club around, this would pretty much have to be it: young, hard-throwing, good command, and under team control for years to come. What else can you say about them? I just hope they can all stay healthy. Familia’s sinker is faster than 99% of the league’s sinkers, and still has more movement than 80% of the league’s sinkers. I haven't heard him described as an "Elite Closer," but that's what he looks like to me. The rest of the bullpen also looks pretty solid. Tyler Clippard has never thrown super-hard, but has excellent classes and a ridiculous change-up that always induces a lot of whiffs. He has always dealt with an extreme fly ball rate without giving up a ton of home runs, a trend that has continued this season. Addison Reed seems somewhat diminished since he broke in with the White Sox, but at the same time he has patched what had been the biggest hole in his game: he used to be an extreme fly-ball pitcher, and now he's getting a respectable number of grounders. Hansel Robles is the hard-thrower among their late-inning guys, and has been effective. They don't have a huge lefty reliever, but Jon Niese has been used in that role this post-season with very good success. This Mets team hasn't just gotten lucky. They are a good team that has gotten better as the season has gone on, thanks to a few key acquisitions, young player promotions, and a few key players returning from injury. It's hard not to look at this team and be impressed. In my view, they match up very well against all the remaining playoff teams. If they make it past the Cubs (still two games to go), they have the power right-handed pitching to handle the Blue Jays. They have the roster depth to handle the Royals. It could be a fun team to watch this month.